Integrity Concrete Coatings provides innovative and comprehensive concrete solutions for a wide variety of commercial applications and budgets. Whether your commercial floors are 250 square feet or 250,000 square feet, the Integrity Concrete Coatings team has the selection, expertise, technology, and experience to handle all of your commercial flooring needs. Let us transform your commercial space with a long-lasting concrete coating — 888-339-9932. We service all of Illinois, Wisconsin, and Tampa! Do you need to resurface your old, worn-out concrete floors? Looking for a durable concrete coating that will help your business and withstand heavy use for years and years to come? This is our specialty! Whether you have a restaurant, store, plant, factory, or some other commercial space, we have a variety of commercial-grade floor coating options. Our most popular floor systems are premiere polyurea, epoxy, polyaspartic, and urethane. Learn more about these floor coatings below. With four times the strength of epoxy floor coatings, polyurea coatings are a long-lasting floor solution that is easy to clean and requires virtually no maintenance. They are also resistant to oil, gas, salt, and other harsh substances. Because of these remarkable benefits, polyurea has been utilized in a variety of industrial and commercial spaces for more than 25 years. At Integrity Concrete Coatings, we only use Penntek’s specially designed polyurea formula. From the striking impact of metallic floors to the subtle elegance of chip system flooring, our team of flooring experts can help you choose from a wide range of concrete coatings to find the option best suited for you. 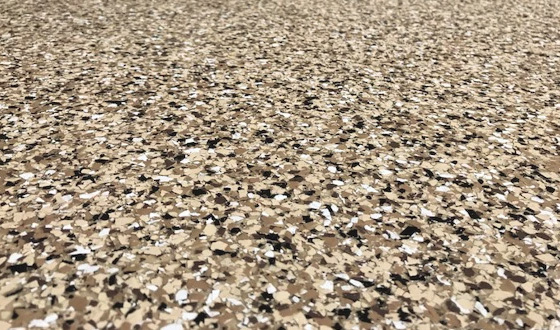 Because of its wide variety of applications, our Penntek Polyurea Chip System is one of our most popular floor coatings. This system is 100% solid polyurea, which offers rapid cure, extreme adhesion, and maximum broadcast times. The vinyl flakes add anti-slip texture and come in a variety of blends and colors to mix and match your design goals. Delivering remarkable resistance to chemicals, abrasions, and slips, the Penntek Stone System is perfect for environments where floors are regularly wet and safety is a concern — e.g. pool decks, showers, locker rooms, restrooms, kitchens, loading areas, and more. This concrete coating system utilizes five distinct layers for maximum strength, resulting in a system that is much stronger than traditional epoxy. Eye-catching and durable, the Penntek Metallic System is designed to enhance the look and feel of any size space. 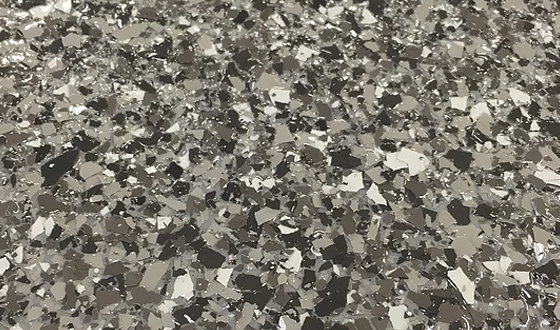 The dazzling 3D appearance of this coating is perfect for showrooms, garages, office lobbies, retail spaces, and other environments that could benefit from a one-of-a-kind floor. Epoxy floor coatings are reliable, cost-effective, and durable. While not as durable as polyurea coatings, epoxy coatings are able to tolerate exposure to many industrial chemicals and provide years of reliable use. Like polyurea, epoxy coatings are also available in a wide variety of patterns and colors, ranging from calm earthy tones to vibrant colors. Our talented crew has extensive experience turning commercial concrete floors into durable works of art. Technically a type of polyurea, polyaspartic coatings are widely used in protective concrete floor coating applications. Polyaspartic coatings can be placed over epoxy coatings. One of the key benefits is its speediness and rapid cure. Often this concrete floor coatings system allows for next-day use. Contact us today to learn more! Can’t decide what type of floor coating or system is right for your commercial space? We can help! Integrity Concrete Coatings is ready to help managers and business owners choose the best floor coating for their specific needs. Based in Northern Illinois and Tampa, Florida, we provide commercial flooring solutions to all of Illinois, Wisconsin, and Tampa. After more than 30 years of intricate paint application for residential and commercial clients, the Integrity Concrete Coatings team knows a thing or two about hard work, customer service, and a job well done. As certified Penntek dealers and installers, we are proud to be able to coat even the most uneven of surfaces. 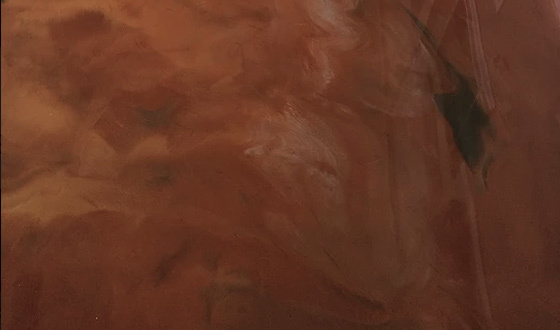 We make sure that all of our floor coatings are able to withstand the wear and tear of any environment while also protecting the underlying substrate from premature damage. We utilize a multilayer system that provides unrivaled resistance to chemicals, impacts, abrasions, and UV rays. Whether you are looking for a durable floor coating for your showroom or a cost-effective way to resurface your industrial floors, our commercial flooring contractors can help you find a durable and attractive flooring solution. Are your commercial flooring needs unique? Do you need a variety of finishes, colors, or custom designs? We understand that there is no one-size-fits-all solution when it comes to flooring, and we love the challenge of a custom project. We are confident that with our experience and versatile Penntek solutions, we can find a custom solution to your individual needs. We pride ourselves on providing the highest-quality flooring systems available. To accomplish this, we work with you to understand your specific needs and then utilize our years of experience to identify the best flooring option for you. Whether you’re looking for a floor system with a three-dimensional look or a durable coating that offers an ultra-quick installation, our goal is to have a solution that will fit your style and budget. We believe in what we do, and we stand behind our work. All of our polyurea coatings come with a 15-year manufacturer warranty as well as a limited lifetime warranty. Contact us to learn more about our warranty options. Regardless of the condition of your floor, the Integrity Concrete Coatings team can perform all necessary prep work — grinding, removing tough, uneven layers, leveling, and more. We know how important surface preparation is to the long-term success of your floors, and we do all we can to prepare your floor so that it forms the strongest possible bond with your new coating. After your floor is prepared, our flooring experts will work their magic. This means that we will install your floor with precision and attention to detail, ensuring that you never have to worry about the long-term performance of your concrete coating. Whether you are getting a new concrete coating or entirely resurfacing your floors, this is a big undertaking, and for businesses, it often means temporarily shutting down. As expert commercial flooring contractors, we are cognizant of this inconvenience and do all that we can to get your business back in operation as quickly as possible (oftentimes we can perform one-day installations). We take pride in our work and go above and beyond to deliver unbeatable results. Additionally, we know how impactful great commercial floors can be to your operation, and we are committed to providing the type of concrete coatings that protects your space and improves your business. With such heavy foot traffic constantly bringing in dirt and other grime, your retail floors must be remarkably durable and easy to clean. Our high-performance polyurea floor coatings provide this and more. To effectively operate a dog kennel, you must have a safe, durable, and easy-to-clean floor. At Integrity Concrete Coatings, we have years of experience providing veterinarians and other facilities with safe, long-lasting concrete coatings. First impressions matter. This is especially true for your showroom. To ensure that your showroom floor is as spectacular as the products you are selling, we provide a range of durable flooring solutions to fit your style and budget. Ready to transform your salon, but not sure how to do it? There’s no easier way to update your salon then by installing a new, sleek floor designed to your liking. Our floor coatings for salons not only look great, but they also provide years and years of durable use. In medical centers and facilities, sanitation and cleanliness are of the utmost importance. This is why many facilities in the Illinois area and in Tampa turn to Integrity Concrete Coatings when in need of new floor coatings. Our high-quality coatings are ultra-easy to clean and can provide mold and mildew resistance. The floors of restaurants and kitchens typically take a beating. On top of heavy foot traffic, tables and furniture is likely to be moved around, heavy items and glassware regularly dropped, and a host of other substantial blows. Our team can help find a floor coating that is able to withstand all of these daily jabs and last for decades. We also provide floor coatings for a variety of other industries and exteriors. No matter your industry or how hard you are on your floor, the Integrity Concrete Coatings team can ensure you are left with a floor that resists fading, chipping, scratches, and dents, and lasts for years to come. Surface prep is perhaps the most important step in the concrete resurfacing process. Without a well-prepped surface, your floor is bound to have problems and not live up to its potential. To create the best possible bond, we start the process by using our state-of-the-art shot blasting equipment, which helps us remove tough coatings, uneven concrete, ceramic tile, and other difficult surfaces. Starting with a level floor is crucial to the success of any residential or commercial flooring job. Our team leverages their extensive experience and some of the most powerful and precise leveling equipment to deliver exceptional results. After your floors have been meticulously prepared, our crew can then apply the finish of your choice. As certified Penntek dealers and installers, we specialize in a variety of durable polyurea finishes, but we also offer cost-effective epoxy options and other coatings. Learn more about our finishes. If you are the proud owner of a business in Illinois, Wisconsin, or Tampa and want to transform your space, our durable and attractive floor coatings may be just the thing your commercial space needs. From concrete resurfacing to polyurea metallic finishes, we have the solution to match your needs and budget. Regardless of the size of your commercial facility, we can provide all of the services you need to transform your commercial floors. Give us a call today at 888-339-9932 to learn more about our products, services, and options. You can also fill out this online form to request your no-obligation estimate.